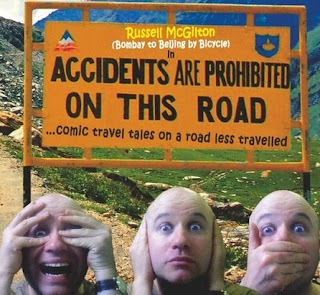 Russell McGilton is a Melbourne-based comedian, author and cyclist appearing at the MICF for the second time. His first show was Bombay to Beijing on a Bicycle based on his (mostly) true adventures on two wheels riding across Asia which also spawned a book and a run at the Edinburgh Fringe. Hi Russell – thanks for talking to Mint Custard. Where are you right now? I’m sitting in front of ‘Tim’ my MacBook. You’ve got almost a full month of shows ahead - have you been doing any Team America-style training montages to prepare? Ah, now there’s an idea. I’ve mostly been practicing the vomiting scene, though I do yoga everyday. Is your backstage area anything like Wayne’s World 2 with lots of alcohol, exotic fruit, mysterious hangers-on and Alice Cooper pontificating about North American native culture? The backstage is actually…well [non-existent]. I have to duck behind a pool table and introduce myself. Quite professional really. It’s good for your quads though. You have to think of these things as a man over 40. Do you have any good luck charms or pre-show superstitious rituals? I used to slaughter a goat outside but now I just get slaughtered afterwards… No, I just make sure I get a good night’s sleep, have no coffee, run through the show at home. Then I play with my five-month old daughter which reminds me that all of this doesn’t matter. Did you really travel from Bombay to Beijing on a bicycle? You know that there are aeroplanes and things for that? I didn’t cycle all the way…I cheated! I did take a plane…and buses…trains. Hmmm…. maybe I should’ve it called it something else and made a movie about it. Oh, that’s right Steve Martin and John Candy have already done that. Did you deliberately choose Bombay and Beijing because of nice alliteration possibilities? Have you thought of going from Fitzroy to Footscray on foot? Bentleigh to Bayswater by bicycle was one idea and Peking to Paris by pogo stick. Actually I read about another cyclist called Dervla Murphy who went from Dublin to Delhi in 1963. I was inspired by that really. I heard that you rode your bike naked through the streets of Edinburgh to promote your Fringe show there. Any similar plans for Accidents are Prohibited on this Road? I might try and throw myself in front of a bus with my pants down…comedians will do anything for a laff. All travellers seem to take pride in having embarrassingly awkward or difficult poos. You must have had a few in your time? It’s too early for that kind of conversation. What international act would you bring out to perform at the Melbourne Comedy Festival if you had the chance? Dylan Moran…but that would be scary because he’d probably bite me to pieces with his acerbic wit. The man is a genius. You’ve travelled a fair bit in your time. Is Dorothy from the Wizard of Oz right when she says there no place like home? Let’s not forget that Dorothy was high on poppies. There’s many places that you can make home with the right drugs. Besides, who can accept aphorisms from a woman whose career is now dependent on The Wiggles? Russell McGilton’s Accidents are Prohibited on this Road is showing at the Softbelly Bar, 367 Little Bourke Street, Melbourne – 7pm Sunday to Thursday from 24 March to 18 April 2010.